West Central Initiative is pleased to announce the recipients of its annual Competitive Workforce Grant awards. 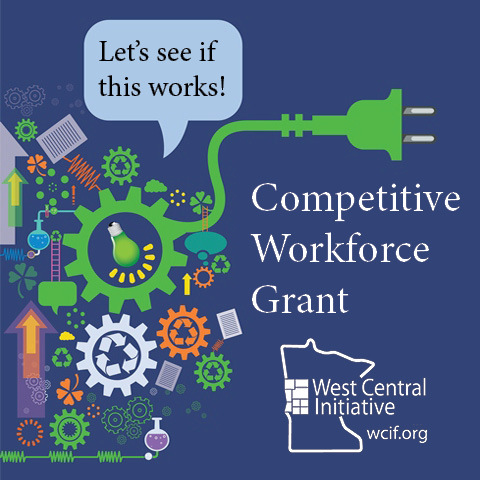 The purpose of the grants is to improve the economy of west central Minnesota by providing one year of start-up funding for stakeholders to launch new, promising workforce development strategies. Alexandria Technical and Community College ATCC received $7,550 for its Machining Summer Camp program. ATCC will offer a four-day camp in the summer of 2017 to provide hands-on CNC/machining experience to 30 ninth-grade students. High school and college instructors will jointly teach the curriculum. The camp will include tours of area manufacturing facilities. Honor the Earth Minobimaatisiiwin Renewables Workforce Training Program received $9,100 for its solar thermal heating project. Honor the Earth will partner with Rural Renewal Energy Alliance (RREAL) to train White Earth Reservation tribal members to install solar thermal panels to help reduce homeowner heating costs. The program will provide immediate work for these members and put them on a pathway to a career in the field of green energy. An added benefit is that the installations will take place in communities such as Pine Point, where 90 percent of residents live below the poverty level. Lakes Country Service Cooperative (LCSC) received $40,000 for its STEAM Team project. STEAM refers to education in science, technology, engineering, art and mathematics. LCSC will pilot a professional development model that will pair cross-disciplinary teams of high schools STEAM instructors with industry partners to jointly develop curriculum that links traditional STEAM content with real workforce applications. As part of the experience, teachers have 18-hour internships with their industry partners. Pope County HRA/EDA, in partnership with the Glenwood Lakes Area Chamber & Welcome Center, received $25,575 for its Pope County Work Ready Communities project. Pope County is working to become the first county in Minnesota to receive national certification by ACT (American College Testing) as a Work Ready Community. The county will leverage the National Career Readiness Certificate program to measure and close the skills gap in their county by building a framework to link, align and match their workforce development efforts. Otter Tail County, in partnership with Otter Tail County Tourism and Economic Development, received $40,000 for the Otter Tail County Rural Rebound Initiative. Rural Rebound will work to recruit workers with needed skills to the region, facilitate collaboration between employers, educators and other entities with an interest in workforce development, and establish a Rural Youth Leadership Institute. Tri-State Manufacturers Association Foundation (TSMA Foundation) received $3,575 for a Dream It. Do It. central Minnesota interactive career expo exhibit that the foundation will use throughout the 2016-17 school year to promote careers in manufacturing.